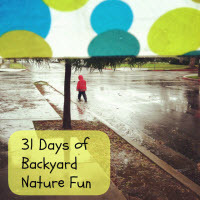 Welcome to Day 14 of 31 Days of Backyard Nature Fun, a month-long series offering simple ways to get outside exploring the natural world. To catch up on what we’ve been up to, you might want to head here. I’m a huge fan of trees. I am in awe of their strength and beauty. They stand tall and unshakable in even the most trying circumstances. They can be content to share their space with others or go it alone. As you might have guessed, I’ve shared my passion for trees with The Explorers over the years. These days, it is often one of them who discovers something new about a familiar tree that I might not have otherwise noticed. Today I pay homage to my friends the trees with activities that can be repeated from one season to the next in any kind of weather and in just about any location. 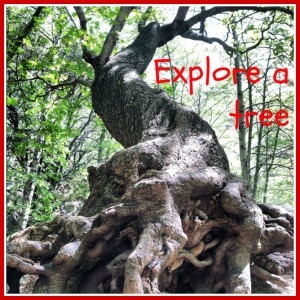 Day 14: Explore a tree. There’s a world full of wonder waiting to be discovered in every tree. Head outside and take a few minutes to explore a tree in your backyard, neighborhood or local park. 1. Identify different tree shapes. What shapes are the trees in your neighborhood? 2. Look for tree roots. Some tree roots are big enough to climb on; others might be a little trickier to spot. 3. Sit under a tree and look up. What do you see? Can you find the top? Is it easier to see from under the tree or from further away? 4. Hug a tree. Do your arms make it all the way around the tree? If not, how many people would it take to stretch around the tree? How does the bark feel? 5. Become tree detectives. Try identifying a tree in your neighborhood using a field guide. This is easier when you can examine the shape and texture of the leaves and seeds. 6. Search for wildlife. Trees are home to critters big and small. Look for signs of life, too, such as markings or webs. 7. Make bark or leaf rubbings. Place a piece of paper over the bark or leaf of a tree. Lay a crayon flat against the paper and make a rubbing. Watch the texture of the bark or leaf appear. It&#39;d be fun to compare the trees from one season to the next – or maybe at least take photographs. We might save this one for summer 😉 Or amend it.